Warne and Murali - who was the greater Test bowler? Muttiah Muralitharan and Shane Warne, the two most successful bowlers in the history of Test cricket, were no strangers to courting controversy during their stellar careers – Murali’s came on the field while Warne’s was largely off it. Warne left the scene first, in January 2007 after 145 Tests, with a world record 708 scalps at an average of 25.4. On 3 December that year Murali surpassed the Australian’s tally and by the time he retired in July 2010 his 133 Tests had reaped 800 wickets at 22.7. Murali took his wickets every 55.0 deliveries while Warne’s career strike rate was 57.4. In terms of five-wicket hauls – often seen as the equivalent of a century by a batsman – Murali is light years ahead with 67, Warne is the second most successful in that area with 37. Murali claimed ten or more wickets in a match 22 times while Warne again sits second overall with ten. 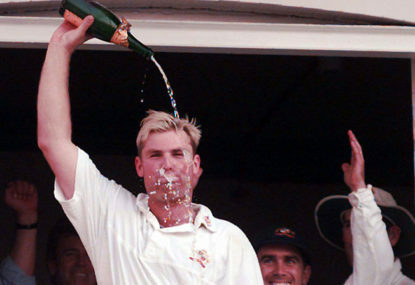 Murali’s economy rate was 2.47, Warne’s 2.65. The Sri Lankan’s best innings figures were 9-52 and his greatest match haul 16-220. Warne’s best was 8-71 and 12-128 respectively. On raw statistics Murali is clearly superior. Interestingly, the two both made their Test debuts in 1992 – Warne in January against India at Sydney and Murali in August at Galle against Australia. In 2001 the sport’s preeminent publication, the Wisden Almanack, chose its five Greatest Cricketers of the 20th Century. As of 31 December 1999, Muralitharan had played 48 Tests, claiming 227 wickets at 27.0 with 17 five-wicket hauls. Warne by comparison had made 80 Test appearances during which he claimed 351 wickets at 25.7 with 16 five-wicket hauls. The panel of 100 eminent cricket luminaries – current and former players and longstanding members of the media – chose Warne at number four. In all, 49 players received votes. Murali did not poll one. In October 2013 – after both Warne and Murali had retired – Wisden celebrated its 150th birthday and to honour the occasion chose its all-time Test XI using a similar method. Warne was included, Murali was not. Murali’s career was plagued with claims that his bowling action contravened the laws of the game. On four occasions he was forced to undergo testing with respect to the legality of his action as a result of being cited by either umpires or match referees. In 2004 the ICC made changes to the laws covering illegal bowling actions, moving from illegality being a partial or complete straightening of the arm from the time the arm had reached the level of the shoulder to straightening being allowed from that point as long as it did not exceed 15 degrees. The variance to the law came in the same year that Murali had been found to have a degree of flex in his elbow when bowling his doosra of 14 degrees after testing was conducted at the University of Western Australia. Many dubbed the change the “Murali Law”. But, regardless of what changes were made, the fact remains that the Sri Lankan officially took 800 Test wickets. Is it merely the raised eyebrows over the years with respect to his technique that has seen Murali snubbed for such gongs as the ones mentioned above or is there in fact legitimate claims to Warne being the superior bowler despite the raw statistical data leaning so heavily towards the Sri Lankan? Murali had a far greater opportunity than Warne to bowl on more spin friendly pitches. In 73 Tests at home, he claimed 493 wickets at 19.6 while on the road he took his 307 wickets at 27.8. Taking that a step further, on the traditional spin-biased sub-continent (Sri Lanka, India, Pakistan and Bangladesh) he played 97 Tests where he claimed 612 wickets at 21.7. Away from the sub-continent his 36 Tests netted 188 scalps at 26.1. In Australia, a country with few grounds seen as being as spin friendly as the sub-continent, Warne played 69 Tests for 329 wickets at 26.4. On the road, in 76 Tests, he captured 379 wickets at 24.7. On the sub-continent Warne played 25 Tests where he claimed 127 scalps at 26.8. Both bowlers struggled in India – Murali captured 40 wickets at 45.4 in 11 Tests while Warne played nine Tests for 34 wickets at 43.1. Warne was of course never required to have bowled against Australia which was the world number one Test side for much of his time in Test ranks. Murali did, on 13 occasions, taking 59 wickets at 36.1 – his record on Australian pitches was far from flattering with his five appearances netting just 12 wickets at 75.4. Murali, with the exception of paceman Chaminda Vass, had little genuine quality support for the bulk of his Test career. In 133 Tests he was on the victorious side 54 times, a winning percentage of 40.6. Warne savoured victory 92 times in his 145-match career for a winning percentage of 63.4. With so many high quality bowling teammates he was greatly aided when it came to team success. The fact that he had to compete with the likes of Glenn McGrath, Jason Gillespie, Brett Lee and Stuart MacGill for wickets it logically means he would had fewer opportunities to return five-wicket hauls. One of the more telling statistics in the Warne-Murali debate is the number of matches the pair played against the minnows. Warne only played Zimbabwe and Bangladesh a total of three times, claiming 17 wickets at 25.7. Murali played each on a combined 25 occasions during which he captured 176 scalps at 15.1. If you remove the matches against those two nations from the pair’s career record it looks like this – Warne 691 wickets at 25.4, Murali 624 wickets at 24.9. Perhaps another key aspect behind the fact that many have Warne ahead of Murali is the belief that the art of leg-spin is far more difficult to perfect than finger-spin. Down through the decades leg-spin has traditionally been seen as a more fascinating and mysterious craft although the likes of Murali have added plenty of mystique to finger-spin in recent times by deriving the doosra. Like so many comparisons in sport, everyone will have their own ideas and draw their own conclusions. After all, one of the joys of sport is the fact it is such a great platform for debate. So Roarers, he is your chance right now – who do you believe was the superior Test match bowler?